The reasons are clear. The Chinese economy, now officially the largest in the world (at least as measured by the IMF’s rather weird purchasing power parity method), is slowing fast. Every bit of data coming out of China shows a worsening situation for manufacturing output, investment, exports and, above all, the purchase of raw materials from other countries. The drop in demand from China for basic commodities has caused a huge drop in commodity prices (the prices for oil, food, iron, coal, industrial metals etc). This drop in prices means less export sales for the likes of Brazil, Australia, Indonesia, Argentina etc. Also the Chinese are not buying so many BMWs, luxury handbags, machine tools, cars etc at home and abroad. That’s bad news for Europe and Japan, as well as the US. The other cause is that, in addition to the global slowdown in so-called ‘emerging economies’, economic recovery in the ‘mature’ capitalist economies remains weak and in some cases looks to have run out of steam. The US economy has done the best since the end of the Great Recession in mid-2009. But it is still managing barely more than 2% real GDP growth a year and its manufacturing sector is dropping back. The Eurozone economy is barely growing and that is only because Germany, the main economic powerhouse, has been able to recover somewhat. The rest of the Eurozone is stagnating and in some cases (Finland, Greece), it is still contracting. Japan, supposedly set to boom under the policies of ‘Abenomics’, named after the Japanese prime minister Abe’s measures of cheap money from the central bank, government spending and neo-liberal reforms of labour rights, has failed to recover much at all. Strong and sustained economic growth in the major capitalist economies remains a mirage. Another problem is the very strong dollar. Banks and financial institutions worried about economic growth elsewhere and looking for higher profits in a safe economy have flooded into buying dollar assets. And as the oil price falls (and it is priced in dollars), more capital has flowed into dollars to compensate. But this has led to a sharp fall in the value of other currencies. Many corporations around the world have borrowed in dollars and get revenues in their national currencies. So corporate debt bills in emerging economies are rising. Many corporations see less revenue growth ahead but bigger debts. So there is a serious prospect of a corporate debt crisis. This exposes a big truth about the global ‘economic recovery’, such as it is, since 2009. It has been mainly based, not on investment in productive sectors to raise productivity and employment, but in fictitious capital, buying back shares, buying government and corporate bonds and property. Cheap and unending money from central banks in their quantitative easing (QE) programmes has restored the banking system, but not the productive part of the capitalist economies. Debt has not been reduced overall and but extended in the corporate sectors of the major economies. There is still a huge layer of fictitious capital, as Marx called it. It is this that is now collapsing. It appears that global investors are beginning to realise that the ‘recovery’ is fictitious and is only on yet another credit-fuelled mirage. The supporters of the latest credit bubble, like Ben Bernanke, the former head of the US Federal Reserve, and Larry Summers, the ‘secular stagnation’ guru , are worried. In the FT today, Summers writes that “a reasonable assessment of current conditions suggest that raising rates in the near future would be a serious error”. The Federal Reserve had been set to start to hike interest rates at the end of this year because the US economic recovery was now assured. I have stated in previous posts here the risk that this posed to the global economy if it was still in what I call a Long Depression (not the same as secular stagnation). Summers too is concerned. But what does he propose that the US policy makers do about it? Summers simply calls for a continuation of the low interest rate policy that has so far signally failed to restore economic growth and instead has merely fueled a credit boom and rising inequality of income and wealth. “Satisfactory growth, if it can be achieved, requires very low interest rates that historically we have only seen during economic crises.” So it’s cheap money forever for Summers. Summers does say that there should be other measures: “such as steps to promote public and private investment”. But he provides no explanation of how investment is to raised by the capitalist sector in an environment where profitability is turning down globally despite the credit bubble. And where is the public investment? The capitalist system needs to be cleansed of the fictitious capital built up under the policies of Bernanke and Summers and the central banks of the UK, Japan and now the ECB. It needs to deleverage not leverage more. The stock market is recognising that. Of course, ‘deleveraging’ would mean another major global slump to devalue capital and restore profitability in the productive sectors. That is the future that is getting closer. This entry was posted on August 24, 2015 at 8:37 am and is filed under capitalism, economics, Profitability. You can follow any responses to this entry through the RSS 2.0 feed. You can leave a response, or trackback from your own site. The “weakness” of the Chinese economy has been blown out of all proportion by the western mainstream media. Even though it is certain that the Chinese economy does suffer from some issues, that country is still far and away the superstar economic performer worldwide. Chinese economic growth is now shifting to merely sensational growth from its previous surreal performance. As for the Chinese economy reducing its imports of raw materials I have not yet seen much evidence of that. What is probably happening with commodities is that there is a relative overproduction of them thanks to the previous 15 years of relatively high prices. Moreover, the commodities space has been excessively monkey-hammered due to the ludicrous belief among investors that the Fed could raise rates in September. In my opinion, there is zero chance of the Fed raising rates in September or even December for that matter. In the case of oil, there is no great “oil-glut” as the mainstream media would have people believe. 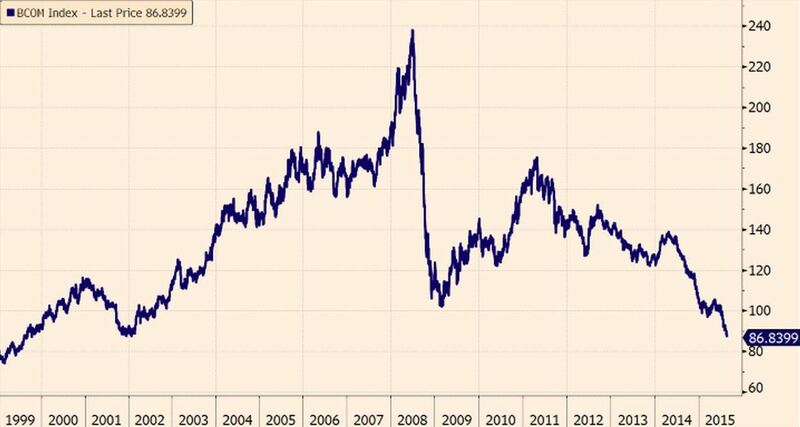 What we have in the global oil market is a “price-war”. OPEC (as well as Russia) know full well that the dramatic rise in oil extraction in North America (Canadian tar sands and US shale) has been down to borrowed capital and immense investment costs mobilized to exploit extremely marginal deposits of oil. As painful as the current low price of oil may be for OPEC and Russia, the fact of the matter is that sooner or later, it will be the high-cost producers (Canadian tar sands, US shale, deep offshore by the western supermajors) that will perish in the end. I would expect the oil price to stage a mighty rally next year. The US shale drillers are facing Armageddon. The same applies to the Canadian projects who are running losses even on their daily costs (outside of their initial, and massive, capital investments) at current prices. The US economy has in fact been growing at 2% flat (during the entire recovery period on average) according to official US government statistics released recently. This is far and away the weakest recovery rate of growth in the US economy, ever! If one factors in population growth (significant in several advanced economies, including the UK and France as well) the per capita increase in US GDP has been the weakest since at least the early agrarian and slave-owning days of the late 18th and early 19th centuries. Japan is only slightly worse than the US or Germany on a per capita basis, if at all, Japan’s weakness tends to be exaggerated by many analysts. There is the issue with their enormous government debt however. As for the EMs outside of China, they are definitely in for a very rough ride this and into the next. Most of them have borrowed heavily in US dollars in the previous period and will have serious trouble meeting the payments now. Especially vulnerable is Turkey, while Brazil also seems in a very tight spot. As for the solutions proposed by bourgeois strategists. Apparently, the full comment didn’t get reproduced. Remember that clam– that it will be the US producers that perish and that oil prices will rally next year when neither occurs. I think arguing “Apocalypse Pretty Soon” is not a concrete critique of capitalism. Arguing that Armageddon is dogging the footsteps of US shale production while claiming that China is simply shifting to “seasonal” growth is like whistling by a graveyard and seeing only the names written in English and not those using Kanji characters. Nearly half (think the most recent estimate is 43%) of China’s steel production units operate at a loss. Doesn’t limit production of course, as nothing stimulates more overproduction like overproduction. Manufacturing output is contracting at its steepest rate in China since 2009; US manufacturing is slowing, and rail traffic has been slipping for several months– all of which is capitalism being capitalism, with more catastrophic impact in places (Greece); and less catastrophic impact in others. So we have the EMs “outside China due a very rough ride;” the EU in a “long depression;” the US slowing; Brazil, Russia, Turkey in recession; Japan reprising its role as the “old man” of Asia; and China somehow is somehow emerge unscathed as the once and future “superstar” of capitalism”? Sure thing and Li Keqiang is channeling “Anna and the King of the Siam”t: whenever he feels afraid, he just whistles a little tune. The full production cycle costs of North American unconventional oil production range from $80 to over $100. This is what makes so certain that North American oil producers are very close to bankruptcy. This is confirmed by any serious observer of the oil business you can find. Time and future events will confirm who was wrong and who had been correct all along. You must also keep in mind, that the information and “analysis” produced by the western mainstream media on countries like China and Russia (especially those two) are nothing more than cheap, black propaganda. They have been demonstrably been absolutely wrong for decades now. Not even elementary information and statistics concerning those two countries are correctly represented in the western mainstream media space. I can provide tons of examples. I don’t know where you got your 43% statistic concerning China’s steel sector, but you must also keep in mind that China produces way more than just steel these days. In fact China is now the world’s foremost producer in a whole range of products. If you go and actually look at the hard statistics concerning each of the major economies of the planet, then you will find that my description is very close to the truth. Yes, EMs (outside of China) will largely experience a deep recession in the coming quarters, it is now more or less inevitable for most of them. Turkey and Brazil are especially vulnerable due to their corporations having heavily borrowed in US$. This does not apply to China in the slightest. China is able to invest in fixed capital around $5T per year, and this is the fundamental basis for her world-beating growth. Yes, China has outshone each and every capitalist economy on the planet for decades on end. I expect this trend to continue, unless internal strife or global war. For reliable commentary on the Chinese economy one must follow the British economist John Ross. He has been getting it right for decades, while ideologues from both the left and the right have been dead wrong time and time again. especially those from the right. My error: yes it is the PMI that shows the accelerated contraction– and that is a leading indicator. In April the value added by industrial output increased 5.6%, the lowest rate since 2008. There is the real contraction in China’s exports and imports on a year to year basis, with April, May, June, July showing steep declines from the year previous. You might regard that as propaganda. I do not. Nor is it possible, IMO, for China’s economy to maintain superior growth rates in the face year over year numbers in exports and imports showing declines: the low agriculture productivity in China; the continued large portion of the population entangled in the rural economy; the decline in the “final consumption rate” in GDP coupled with the growth in the capital formation rate and the acceleration in fixed asset investment as a portion of GDP growth. If somehow leveraging, debt overhang, etc. is a problem for capitalism in the EU, or in EMs, or anywhere, then we really have to acknowledge China’s precarious condition as China total debt is now estimated at $28.2 trillion, with half of that concentrated in the real estate sector. If overproduction is a problem for capitalism then we have to grant the seriousness of the problem in China where auto dealers are maintaining their highest inventories in years; where container ship overproduction has forced rates to levels below the recapturing of operating costs; where steel overproduction and “weak domestic demand” in China and has led to a 50% increase in exports to the EU despite the overall decline in China’s exports (the WSJ is the source for the estimate of lack of profitability in China’s steel production. I think the date of the article was August 1). What is remarkable is that China has been able to maintain its growth despite all the accumulating conflicts and limits to that growth. What is even more remarkable is that anyone can believe a) that the growth can be sustained without serious, deep, contraction and b) that China is not subject to the exact same constraints as capitalism anywhere and everywhere– that the markets don’t function in China as the markets do in the rest of the world, transmitting, and shaping the overall trends of capitalism, as laws intrinsic to Chinese capitalism. You expect this to reverse itself in a year; that is to say, US producers will be in catastrophic decline, but prices will recover and “low cost” producers– like Russia– will emerge invigorated. Wanna bet? Thanks S. Artesian for putting things in perspective as usual. I have seen the denial brigade writing pages of comments denying the slow down in China in “mainstream” media but not here until now. China must be on another planet in isolation. In recent weeks the government in China has done whatever it could to prop up its stock market to no avail. Threatening sellers, suspension of trades, and buying shares among other tactics. The problem is that it can hide and fudge economic stats but sure doesn’t seem able to fudge stock market indexes. Gold and oil will have a “mighty” recovery by next year (this is a recording). Why not? It’s another planet. It’s spring in Kondratiev cycle. isn’t it? there will be the political will from dogmatic western governments in raising public investment (they perceive public investment as a concession to communism or something) is highly doubtful and this leaves only further monetary easing, namely, more QE. This will in the following years drive rich-world currencies lower and probably cause an inflation of the prices of commodities and especially oil and gold. I believe that the dollar value of gold is due a massive increase in the coming years. But that is another big story altogether. Viktig kommentar fra Michael Roberts. Even so, the 5-year trend of Chinese exports is still firmly upwards: http://www.tradingeconomics.com/china/exports – even in the face of extremely weak economies everywhere. It is pointless to look at extremely short-term fluctuations. You claim that it is impossible for China to persist in outshining every other capitalist economy on the planet for too much longer. This is virtually impossible to either confirm or disprove. What we know for sure however, is that China has been been outperforming any other sizeable economy since 1978. Clearly, China’s high-savings, high-investment, state-led and market-enhanced model has done something right, we have four decades of history confirming exactly this. South Korea employed a somewhat similar model with similar historical trends in relation to the long-term growth of its economy. Sure, Korea is a much smaller (hence more easy to export itself to growth) country and enjoyed the aid of the West on several levels, but China is right on South Korea’s footsteps. Now, whether China can fulfill her long-term development plans (Belt and Road Policy, the Made in China initiative, etc) remains to be seen, but I have seen enough to not want to bet against the Chinese leadership. So yes, to reply to your question, China is indeed a unique case in the history of economic development, for this there can be no doubt. What would be the ultimate end of this process, I think that nobody is able to tell at the moment. As for China’s debt burden. Basically, the Chinese SoEs, owe lots of money to the Chinese state, which is not nearly as big a problem as the western mainstream media make it out to be. There is a risk of moral hazard, but not of bankruptcy. Like I said above, China has proven to indeed be an exception in the history of economic development, all that remains to be seen, how long will this exceptionalism last. As for my “serious observers” of the oil industry, they are not pre-selected, and are in fact, by their own admission, quite lenient with North American unconventional oil production. David Hughes clearly states that he is basing his overall analysis on a best-case scenario for the shale drillers. In any case, one needs not be an economic genius to see what has been going on with US shale production as well as Canadian tar sands production. Both processes are extremely expensive, which is the only reason why the price had to spike to over $100/bbl for anyone to get really excited about them. Even at over $100/bbl, these projects have been bleeding cash, lots of it. Any source will confirm this. Once the price really begun to collapse around November of last year, these companies as well as the histrionic media started running stories over how they were making immense efficiency gains, something which is not at all corroborated by their balance sheets. These companies have been bleeding cash at an astonishing rate. During the first half of the year, they have been spending 2 and a half dollars for every single dollar earned. The only thing that kept them alive was speculative equity flows chasing rising yields and price hedges with banking institutions. These price hedges will begin to expire this coming October and through the coming months and years. The financing through equities has dried up in recent weeks and energy sector debt has been hitting critical levels in recent weeks. Even their reduced investments could not turn these companies around and will rely on more good money being thrown after bad if they are to survive a bit longer. The reason why shale production has kept up (mind you, it has been slowly declining in the past few months and many believe that the EIA is overstating its estimates, remember, we are only dealing with “estimates”) reasonably well, is that like I said above, lots of new loans were raised in the 1H of 2015 and also because a backlog of already drilled (yet uncompleted) wells has been brought online. It is only a matter of time for this process to run its course. What I must have said a few months ago, is that within two years, and provided that the oil price remains low, the North American unconventional (other word for extremely expensive) oil bubble will have imploded and I firmly stand by that now. The process is clearly well underway. And yes, Russia has managed to keep her production up, and even increase it a little bit, despite the fact that she is much less capital rich than her North American enemies and despite the fact that the combined financial might of North America, Europe and Japan has been mobilized against her. All the Arabs and the Russians have to do now, is to go through a few more months (18 at the max) of pain, until producers of and investors in extremely marginal oil deposits get the message. I stand completely behind my initial calls. 1. Exports and imports in China per month in year-over-year comparison contracted in January, February, March, April, May, June, July– if that’s a “seasonal basis” then we’re using different calendars. No such 7 month seasonal trend was manifested in 2014, 2013, 2012. 3. Almost everything you say about oil production is, appropriately enough, speculation–and is somewhat hilarious in that the weakness you see in the shale sector– leverage, hedges, bank plays, overproduction, price declines– etc that must have, or will shortly, run their course and be followed by an implosion, are those same things– the leverage, the declining profitability, the overproduction– that characterize the Chinese economy, which nevertheless, according to you, faces a future so bright you need sunglasses to even glimpse it. 4. In the meantime– the US shale sector is not immune in any respect to continued overproduction. I have never argued that it is. You are predicting its imminent collapse, within 18 months, a recovery in the price of oil and the coincident resurgence in the Russian economy. I don’t think so. I think the overproduction will persist, the price of oil will continue to decline, and nobody’s economy is going to benefit. 1. The decline in industrial value added is a decline in the rate of growth. 2. The decline in exports/imports is an absolute decline in value. 3. The argument that China is much less of an export oriented economy because it is “transitioning” to one where domestic consumption is the “driver,” might be powerful….if there were data to show that domestic consumption had increased relative to capital formation, fixed asset investment etc. as a contributor to GDP. The data from the National Bureau of Statistics does not support that claim. 4. Stavros claims: “Clearly, China’s high-savings, high-investment, state-led and market-enhanced model has done something right, we have four decades of history confirming exactly this” omits the critical basis for the 3.5 decades growth in China. Fundamental to Deng’s “4 reforms” was the determination to make and keep China as a “low wage” economy, using the low wage to attract FDI; and certainly that has “worked,” particularly if you’re a big supporter of capitalism. A cool trillion in FDI goes a long way to making one a superstar in the capitalist firmament. However as wages have risen, and as China confronts the obstacle of its low productivity agricultural sector, the markets simultaneously exhibit a fall in profits, and constraints on further growth. That, IMO, is what is going on now, synced and exacerbated by the generally weak recovery of capitalism since 2008. 5. As for a “recovery” in oil prices, occurring “next year…” what does such a recovery require, or presume? It presumes an expansion of trade, circulation as the amount of oil required for each unit of industrial output has declined BUT oil still underpins 96% of the energy requirements for transportation. WTO reports on world trade register a general slowing in the growth of such trade. There is also the potential for a real decline (such as China exhibits on a “national” basis). If you want to speculate about oil, and who is going to benefit….well, I’d be willing to be the counter-party in that trade. I’d go short. 1. Whoever denied that the Chinese economy is decelerating in its growth? What I am denying is that the Chinese economy is headed for a meltdown and a protracted period of weakness. My claim is that the Chinese economy will continue to grow much faster than any other major economy (possible exception of India) for the years and even decades ahead. 2. Even if China experiences a sharp recession in the coming period, its economy will recover a la South Korea in the late 90s. Even so, it is highly unlikely that China will experience such a dramatic contraction at any time in the near future. 3. The financial commentators in the West have been predicting some combination of stagnation/collapse for China for decades now, this is only one of the many reasons they cannot be taken seriously. They are performing ideological and strategic propaganda most of the time, not serious analysis. 4. The great achievement of Deng’s was that he did away with ideological dogmatism and followed a policy that brought results. (I don’t care if it’s a black or white cat and all that) The Chinese leadership have shown to be very wise in their pursuit of economic development without falling into the silly trappings of market romanticism or even socialist romanticism. Sure you can point to the customary ills of a capitalist economy and their presence in today’s China. but there can be zero doubt that that past four decades have seen an economic miracle previously unimaginable in human history. Has any purely statist economy performed better than China in recent years? 5. China’s trade intensity has decreased markedly in recent years (the share of its economy going to exports/imports that is) https://www.quandl.com/collections/economics/exports-as-share-of-gdp-by-country Those figures go up to 2013, trade intensity in the Chinese economy is still decreasing. 6. The fact that wages in China have risen markedly in recent years (they have risen above the rise in profit) demonstrates that China is no longer a low-wage economy, since there are many populous countries in the world right now with much lower wages. Rising wages do not of themselves erode a country’s competitiveness. There are many other factors at play, such as: capital and technology employed, ability to produce at large volumes, ability to produce at a short notice and with speed, ability to produce at low cost. These, incidentally are the factors in which China excels, and this is why China’s position as the leading manufacturing power on the planet is assured for decades ahead. Chinese firms are extremely good at reverse engineering (no small feat) western products and selling them on the market for less than half the price. 7. More importantly, China’s advantage is that they are able to maintain their fixed capital investment (as well as savings) at extremely high levels. This is what what has underpinned the growth of the East Asian economies in recent decades, and this is even more pronounced in the Chinese case. The problem for US shale producers, Canadian tar sands producers, deep offshore in several parts of the world is not merely their excessive leverage (which is massive in the first two instances) or overproduction or things you would look for in conventional capitalist industries. No, their main problem is extremely poor and marginal quality of the oil deposits they are operating in. Western companies have much more capital and superior technology available to perform their operations, but have depleted their easy-to-reach reserves long ago. Forget about the noise coming from propagandistic publications such Bloomberg or CNBC. The full-cycle costs of producing a barrel of oil in the shale patch or the tar sands is around $100 (in some cases lower, in others, even higher than that) This is demonstrated by the fact that the vast majority of shale drillers were losing serious money even with oil at around $100/bbl. The costs in deep offshore oil production vary significantly, but are still way higher than those in the Middle East or Russia, and in some case approach the insane $100/bbl mark. What you read many times in the press when people are claiming that this or that company “breaks-even” at $40, is merely the pumping and operating cost, not the full cycle cost of exploring, drilling, completing, transport, taxes, paying debt etc etc etc. The losses in the first half of 2015 were horrendous for the shale producers (see: Art Berman’s blog. A very serious Texan geologist who even owns EOG stock) It is only credit and hedges that keeps these corporations alive. Now yes, this does not mean that just because the price of oil has fallen below the marginal cost of production, that production will immediately fall in response. There is certainly a necessary lag period. Even the best wells decline at around 5% per year. Shale wells, decline at around 70% per year. Once investment dries up in the shale patch, the collapse will be immediate and significant. Tar sands are more large-scale, long-term projects and those projects that are already running, will persist in doing so until they peter out. But with current prices, no new projects in Alberta will go ahead. Zero. Now contrast the position of North American drillers (who can seemingly be losing money for almost a decade and still get credit) to that of the Russian oil industry, with much less funds, presumably inferior technology (though not by as much as many people tend to think) and completely shut out of the western money markets. Even so, Russia still managed to increase her production further, and Rosneft has drilled over 800 new wells in recent months. The reason behind this is very simple, Russia’s oil reserves are much more plentiful than those of North America and therefore, oil production there is far less costly. The difference between the oil business and other capitalist industries, is that the number one factor in oil is not technology, or availability of capital, but GEOLOGY. It is for this reason that I am predicting an OPEC-Russia victory over North American producers, even though it will be a bloodbath until then. Nobody’s arguing anything EXCEPT that overproduction impacts capitalism as a whole. You OTOH are arguing that China can exempt itself from those impacts. I don’t think it can, as it did not in 2008-2009. Re oil: your claim is that “within the next year” oil prices will rally, and that in this rally Russian and the low cost OPEC producers will “triumph” with US shale producers essentially driven from the markets. We’ll check back with you this time next year, and then again in December 2016 to see how accurate your predictions turn out to be.